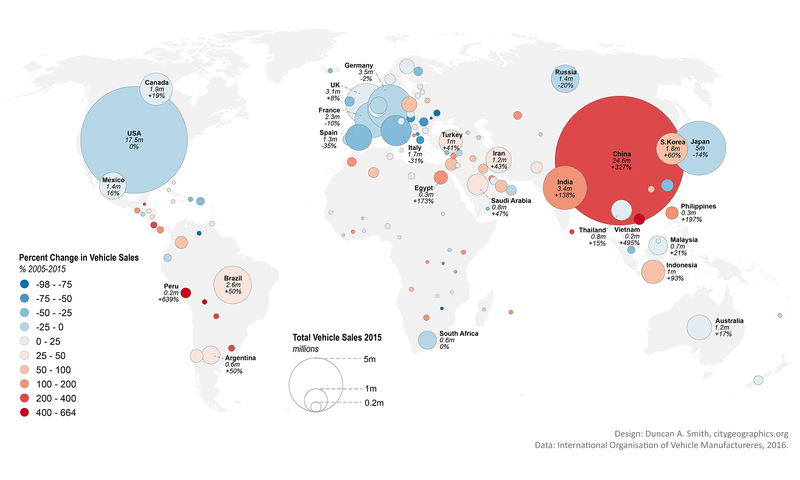 Earlier this year I worked on some charts and maps for a Greenpeace report authored by sustainable transport academic Robin Hickman, exploring the impacts of automobile dependence and the prospects for a post-car world. The report is online here. 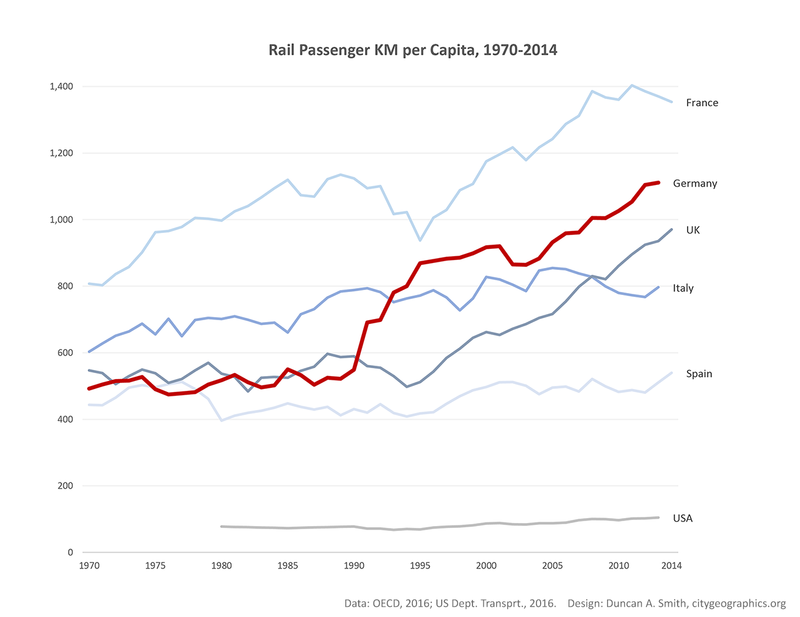 The much debated phenomenon of ‘peak-car’ can be observed in many countries in the global north, in terms of a levelling off of private car use and increases in public transport, as shown in the graphs below. 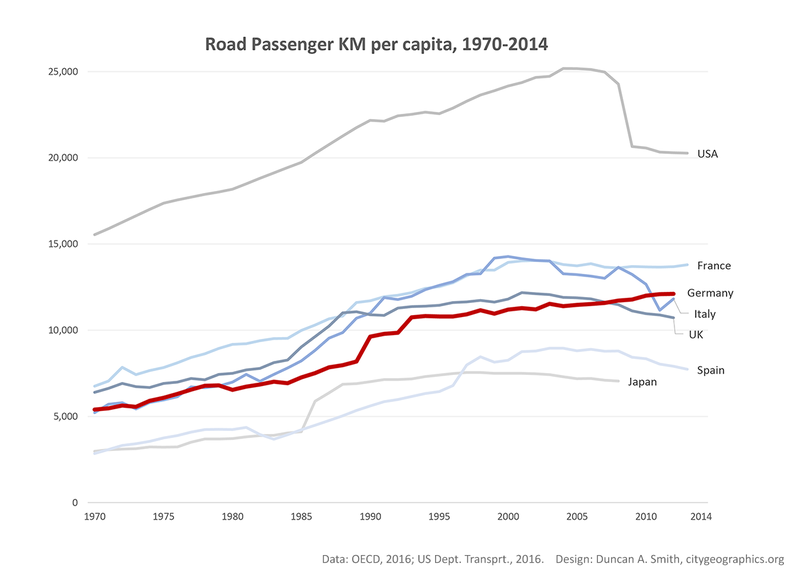 Many theories have been put forward to explain this trend, from the growth and densification of cities, to economic crises, fuel tax changes, to declining car use by younger demographics, and behavioural changes related to the internet. 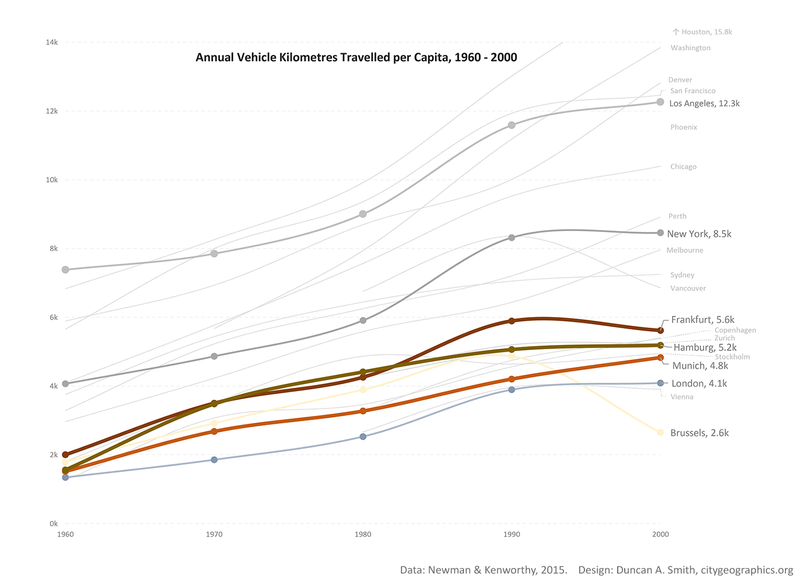 Given the many negative impacts of automobile dependence, from substantial GHG emissions, to air pollution, millions of road deaths annually, and contributions to the global obesity epidemic, clearly this behavioural trend is a great opportunity to develop more sustainable city forms much more widely across the globe. 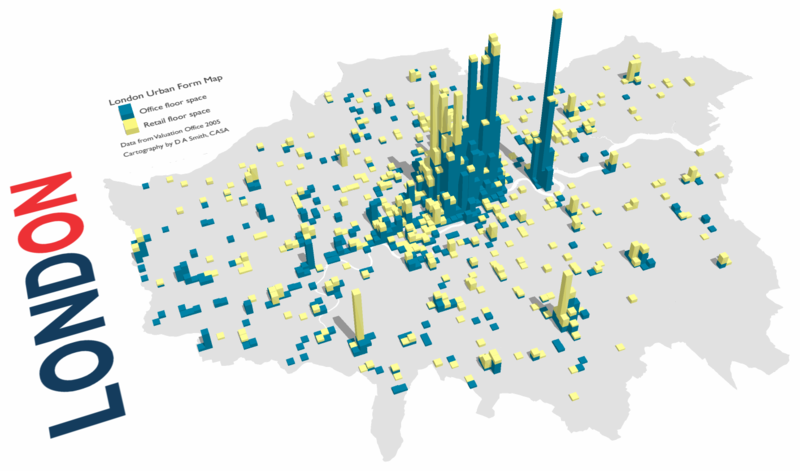 This process is also observable at the level of individual cities, using data compiled by Newman and Kenworthy. Unfortunately this data is only available up to the year 2000. 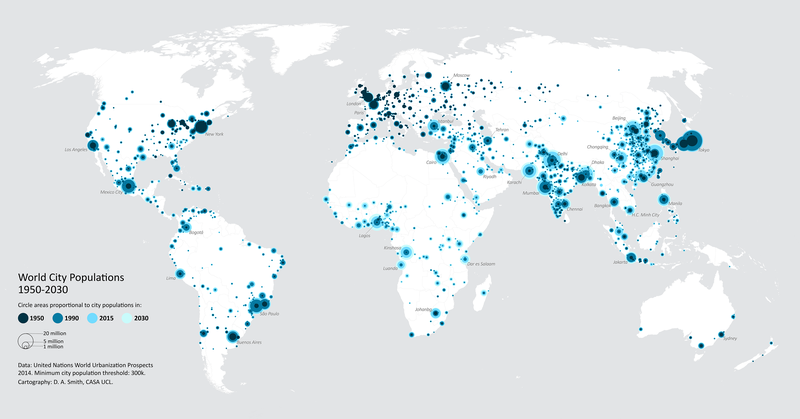 The World City Populations Interactive Map is now available as a static map, and has been published as a Featured Graphic in Environment and Planning A. 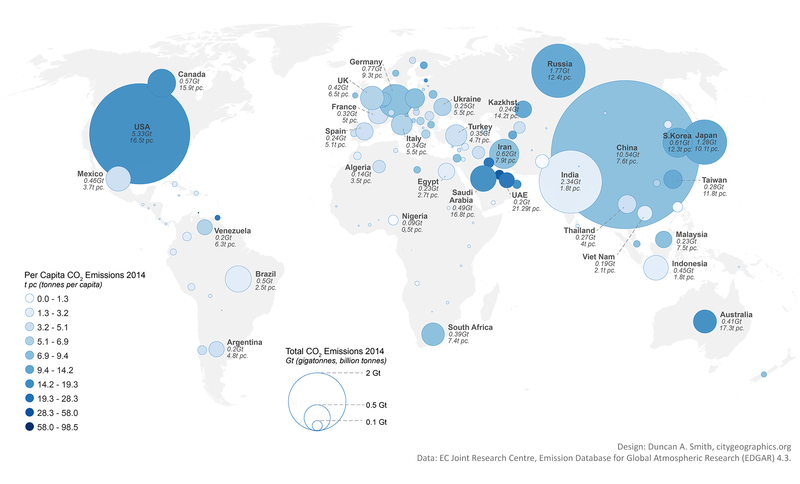 The EPA article includes details on the UN World Urbanization Prospects data, and the methods used to create the map. As cities expand with multiple centres spread over massive regional hinterlands, the need to better understand the geographical variation across and within cities has become more pressing. This need applies strongly to issues of travel sustainability, where urban centres differ greatly in the accessibility they facilitate for private, public and active transport. Spatial indicators are a useful tool to summarise complicated intrametropolitan patterns, as illustrated in my new working paper mapping CO2 emissions from journey-to-work travel across the London Region. 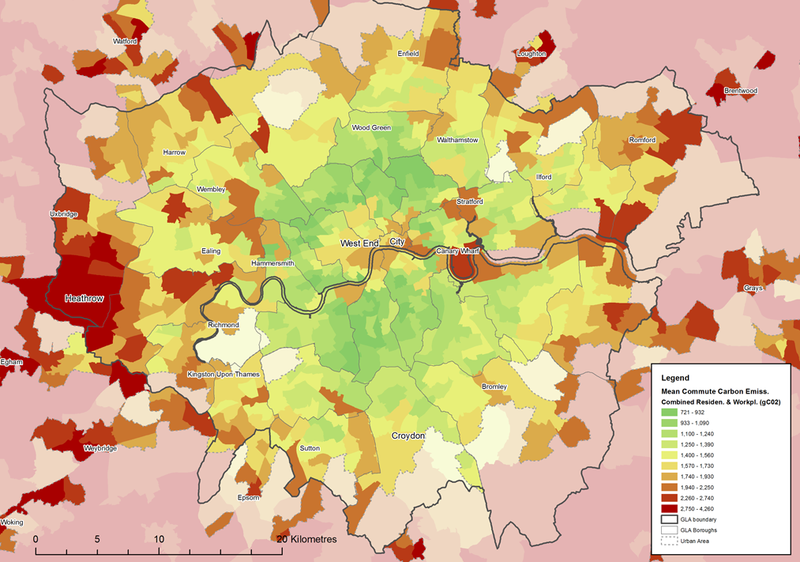 The results of this indicator show a massive range of travel emissions by workplace of up to 300%, with particular problems for airports and the specialised employment region of the Western Sector, as can be seen in the map above. “This paper develops a methodology for estimating network distances and CO2 emissions for UK census ward-level journey-to-work interactions. 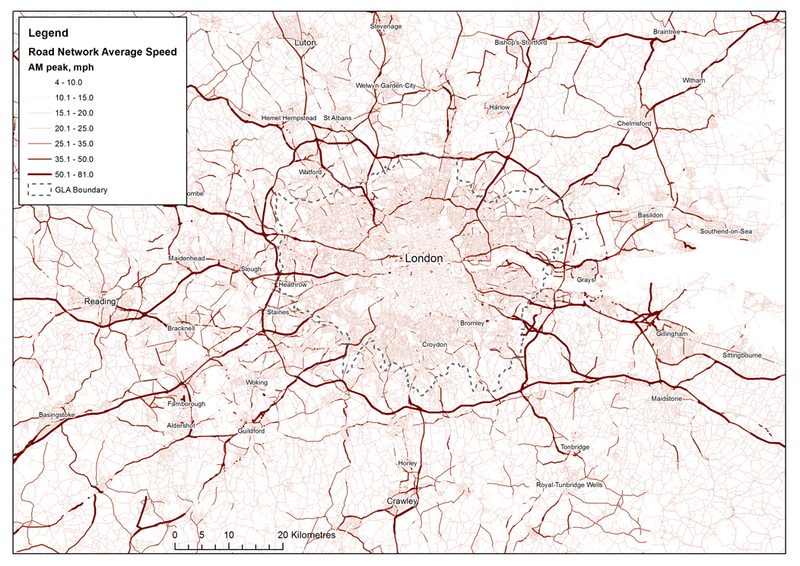 Improvements are made on existing empirical measures by providing comprehensive intra-metropolitan analysis; increasing network routing accuracy with UK public transport timetable and GPS-based average road speed data; allowing multimodal travel; and developing metrics suitable for travel sustainability analysis. The output unit of CO2 emissions has been selected to enable the integration of mode-choice and travel distance data, and to aid compatibility with integrated assessment applications.